A stellar, record-breaking class of freshman has entered Arizona State University’s Ira A. Fulton Schools of Engineering for the fall 2012 semester. It’s not only the largest in number but one of the most academically impressive. 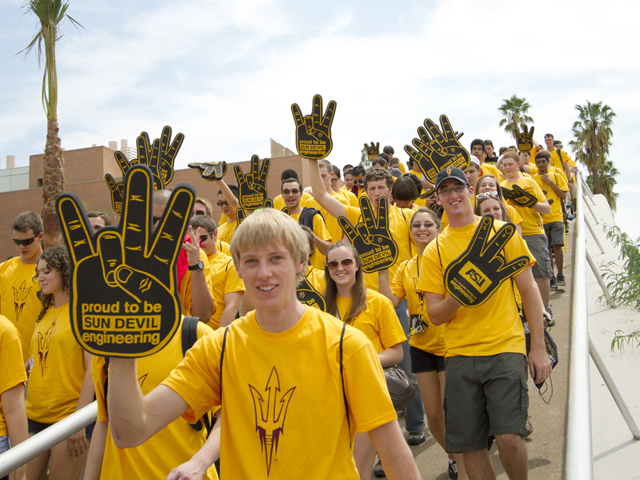 More than 1,500 freshmen were enrolled on the first day of classes – the most ever for ASU’s engineering programs, breaking the previous record of 1,276 a year ago. One of out every five of the new freshmen has been accepted into ASU’s Barrett, The Honors College. The 317 freshman engineering honors students are an increase of more than 30 percent from last year. That helps give ASU’s engineering schools one of the highest overall percentages of honors students in any program at ASU. More than 40 percent – 644 freshmen – have earned Arizona merit scholarships. Forty of them have earned National Merit Scholarships and 20 are National Hispanic Scholars. Among the new ASU engineering students are six of this year’s 22 recipients of the Flinn Scholarship, the most highly competitive merit-based college scholarship program for Arizona students. There’s also a winner of the equally competitive National Achievement Scholarship. The number of females in an ASU freshman engineering class has exceeded 20 percent, with an increase to 317 this fall from last year’s count of 236 female freshmen students (18.5 percent of the 2011 freshman class). In addition, compared to a year ago there has been a 36 percent increase in the number of Hispanic freshman and nearly a 30 percent overall jump in the number of freshmen from groups that are underrepresented in engineering professions. Of course, numbers don’t tell the whole story. The hopes, aspirations and experiences of individual freshmen students help paint a fuller picture. Susan Sajadi’s experiences early in life have led her to choose engineering as a major. “I decided to focus on biomedical engineering, because as a child I had pneumonia several times and spent a lot of time in the hospital,” Sajadi explains. She’s considering medical school as a next step after earning a biomedical engineering degree. James Boulton says his longtime fascination with technology combined with his affinity for math and science led him to choose an aerospace engineering major. Beyond gaining the skills that will open up job opportunities, among Boulton’s important goals for his time at ASU include making “lifelong friends and connections” that will be valuable to him in and beyond his career. Civil engineering major Wesley Scatena from Surprise, Ariz., is already to looking ahead to 10 years after earning his degree. By then, he says, he hopes to be opening his own civil engineering business. To lay the ground work for reaching that goal, Scatena is planning to participate in a number of student engineering and technology competitions throughout his undergraduate years, and to obtain internship positions that will enable him to learn about the business side of the engineering profession. Scatena already has a jump-start. This fall semester he will continue an internship he began during the summer with the Arizona Department of Transportation. Dalton Osmanski, an aerospace engineering major, says he wants to follow in the footsteps of his father, who is an airplane mechanic. “I’ve had an interest in airplanes since I was young,” says Osmanski, who comes to ASU from Chicago. He would like to help make improvements in fighter- jet technology and gain expertise in aerodynamics so that one day he can broaden the possibilities for the human experience of flight. His decision about where to go to college was based in part of the size of the institution and its variety of academic programs. “I feel ASU will be a great place to get my education because there are so many other subjects to study if my Plan A has to change,” he says. Kathleen Farrell, from Spokane, Wash., has chosen a biomedical engineering major with thoughts of a career in medicine, but she’s also interested in helping develop renewable energy sources and in water conservation efforts. Alex Tower, from Reno, Nev., recalls becoming interested in engineering when he was middle school. Now he plans on using a college degree in aerospace engineering to attain his goals of becoming an officer in the Marine Corps and working in the aviation industry. So far, Tower says he feels confident he’s found a school that will help take him there. “ASU has a great engineering program and the support from within the engineering community has really impressed me,” he says. Deanna Weathers-Perez also has military service on her agenda. She’s in the Air Force Reserve Officers Training Corps and plans to complete the program at ASU while she earns a biomedical engineering degree. Her father is in the Army, so the family has lived in many places, including Italy, Washington, North Carolina and Georgia. “I’m used to moving around,” she says. So she decided to head west and found ASU offers what she is looking for in a college education. “I am in love with math and science, so it was not hard deciding on engineering for my major,” Weathers-Perez says. She sees herself contributing to advances in medical technologies, specifically X-ray imaging. Biomedical engineering major Aimen Vanood has her eye on a career as a physician. She hopes to get opportunities to volunteer at local hospitals during her undergraduate years at ASU. An engineering degree and volunteer experience “will help me become a more well-rounded person with a broad scope of skills,” and thus a better candidate for medical school, Vanood says. She plans to explore branches of the medical field that focus on helping people living with disabilities to overcome their physical challenges. At ASU, he wants to apply his education by contributing to community projects and taking advantage of opportunities for undergraduates to conduct research. Mechanical engineering major Esteban Morales, from Prescott Valley, Ariz., also says he set himself on a path toward engineering at a young age. “Ever since I was a little boy I would take apart my broken radio-controlled toys and figure out how to fix them.” Morales says. “I would do this with any toy that involved movement, so it was a natural decision for me” to major in engineering. At ASU he “would love to be a part of some kind of great engineering project” with fellow students. In his future career, he’d like to use his engineering skills to help the country develop more sustainable energy resources. He’s also looking to overcome a challenge common to many university freshman.